Special Report: Who Really Controls the World? These questions have long been subject to speculation, scapegoating, and paranoid ravings — some more well-founded than others. This scientific process sheds light on the dark corners of bank control and international finance and pulls some of the major players out from the shadows. And it goes back to the old credo: Just follow the money. Systems theorist James B. Glattfelder did just that. Superconnected companies are red, very connected companies are yellow. The size of the dot represents revenue. I'll openly admit that this graphic almost scared me off. Complex scientific theories are not my forte, and this looks like some sort of intergalactic snow globe. But Glattfelder has done a remarkable job of boiling these connections down to the main actors — as well as pinpointing how much power they have over the global market. 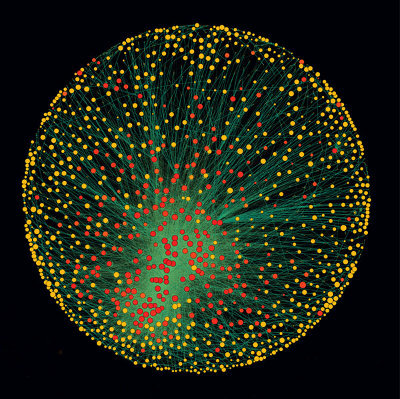 These "ownership networks" can reveal who the key players are, how they are organized, and exactly how interconnected these powers are. Each of the 1318 had ties to two or more other companies, and on average they were connected to 20. What's more, although they represented 20 per cent of global operating revenues, the 1318 appeared to collectively own through their shares the majority of the world's large blue chip and manufacturing firms - the "real" economy - representing a further 60 per cent of global revenues. According to his data, Glattfelder found that the top 730 shareholders control a whopping 80% of the entire revenue of transnational corporations. And — surprise, surprise! — they are mostly financial institutions in the United States and the United Kingdom. Some of the other usual suspects round out the top 25, including Morgan Stanley, Credit Suisse, and Goldman Sachs. What you won't find are ExxonMobil, Microsoft, or General Electric, which I found shocking. In fact, you have to scroll all the way down to China Petrochemical Group Company at number 50 to find a company that actually creates something. Barclays was a main player in the LIBOR manipulation scandal and was found to have committed fraud and collusion with other interconnected big banks. It was fined $200 million by the Commodity Futures Trading Commission, $160 million by the United States Department of Justice, and £59.5 million by the Financial Services Authority for "attempted manipulation" of the LIBOR and Euribor rates. These are the guys who run the world. It's essentially the "too big to fail" argument laid out in scientific setting — only instead of just the U.S. banks, we're talking about an international cabal of banks and financial institutions so intertwined that they pose a serious threat to global economics. Glattfelder contends that "a high degree of interconnectivity can be bad for stability, because stress can spread through the system like an epidemic." Industrialist Henry Ford once quipped, "It is well enough that people of the nation do not understand our banking and money system, for if they did, I believe there would be a revolution before tomorrow morning." Just another reason to stay on the Outside. Jimmy is a managing editor for Outsider Club and the Investment Director of the personal finance advisory The Crow's Nest. You may also know him as the architect behind the wildly popular finance and investing website Wealth Wire, where he's brought readers the stories behind the mainstream financial news each and every day. For more on Jimmy, check out his editor's page.